Go To The Just Released Book, "The Invitation"
[Above] The Loki eruption (top) was captured in the Io discovery picture (see website logo) as a bright spot on the boundary between day and night called the terminator, on Io. The discovery picture also features the Pele eruption found by Linda off the limb of Io, the first volcanic eruption seen beyond Earth. The Pillars of creation (bottom) captured by the Hubble Space Telescope, where new stars and potentially, planetary systems are being born. Linda Morabito began her undergraduate work in Astronomy at the University of Southern California, with an emphasis on extragalactic astronomy and cosmology. She joined Jet Propulsion Laboratory in 1973 as a temporary summer employee and then again in 1974 after securing her undergraduate degree in Astronomy. Linda worked as a senior engineer in the Outer Planet and Navigation Section at Jet Propulsion Laboratory from 1974 to 1981. She was a member of NASA's Viking Flight Team and was a guest investigator on the Viking Extended Mission to Mars. In 1979, she discovered the currently active extraterrestrial volcanism on Jupiter's moon Io. She has served on several state-of-the-art planetary and extragalactic education programs for student researchers in association with NASA spacecraft missions. She is currently an Associate Professor of Astronomy at Victor Valley College in Victorville, CA where she is conducting research on a new cosmological model of an accretion universe, and on the historical perception of this age of science. [June 2, 2016] There are certain moments when we can sense change on a large enough scale that history will record it. On Monday morning of this week, I had the enormous privilege of nominating Dragan Hajdukovic for the 2017 Breakthrough Prize in Fundamental Physics. For those of you who might not be familiar with the Breakthrough Prize, it is the largest prize in Fundamental Physics in the world, larger than the Nobel Prize. It is to acknowledge the importance of scientific breakthrough, which holds enough potential that its support could lend to experimental verification, and move us forward in our understanding of the Universe in which we live. In a departure from their work in astrophysics, Linda and Dave have taken a look at spiritual aspects of the lives of scientists, and have written and released their new book to forge a path between Christianity and scientists! "The Invitation: Christianity for Men and Women of Science, A Miracle for Our Time" is now available! Read further about "The Invitation", and purchase it here, or at a bookstore near you! It is a truly amazing time in astrophysics and a theory of everything that arises from the work of former Cern physicist Dragan Hajdukovic. Published on September 25, 2014, in Physical Review D, “Neutrino lighthouse at Sagittarius A” by Bai, Y., et al, provides the first evidence from IceCube that the supermassive black hole at the center of the Milky Way is a neutrino factory! In his new comment on the recent findings of IceCube https://hal.archives-ouvertes.fr/hal-01086344v1, specifically that 9 events of neutrino detection out of 36 so far appear to be coming from the center of the galaxy, Dragan establishes the plausibility that the detection of those 9 events is the predicted evidence of the inevitable consequences of his theory. Given that the number of protons passing beneath the event horizon of the supermassive black hole are best determined by computer simulation, the results in lieu of simulation are extremely supportive of Dragan’s work! This is a hint that when the UX25 minor planet system is observed by a team of Italian astronomers, they will observe the change in the moon’s perihelion shift due to the gravitational properties of the quantum vacuum that Dragan has proposed, which are at the foundation of his work. Should Dragan’s work be validated by observations of the UX25 system, it will be historically akin to the advance of the perihelion of Mercury that Einstein proposed to exhibit the effects of General Relativity beyond Newtonian physics. Although IceCube cannot distinguish between neutrinos and anitneutrinos (only through Glashow resonance) nor can it detect energies sufficiently low enough to validate Dragan’s computational predicted differences between the number of antineutrinos expected from the Milky Ways’ supermassive black hole and Andromeda’s supermassive black hole (which would in fact directly validate his theories), this hint from the center of our galaxy holds the promise of validation of Dragan’s work - a new physics, and much awaited understanding of not only the new findings by IceCube, but the true nature of dark matter and dark energy! Linda and Astronomer David Meyer have recently completed several important research papers on the history of physics including their latest paper "A Snapshot of Contemporary Physics and Cosmology - The Spirit of our Time (Der Geist unserer Zeit) A Historical Review". You are encouraged to read these papers for a glimpse into the nature of science in the world today. The greatest physicist of our time, former Cern physicist Dragan Hajdukovic writes about his revolutionary new model of the Universe! "Hundreds of beautiful photos, from Io to galaxies to a rabbit a portrait of Ray Bradbury, and Linda's chatty blog notes, rambling enthusiastically from Mars rovers to speculations about religion and the nature of the universe. Ideal for electronic media, where the photos just glow." "The serial survey of NASA space probes is clear and lucid. One rarely finds such a comprehensive review of our full presence in space." "With this book, Morabito has brought us along on an engaging, thought-provoking journey from Terra Firma to the furthest reaches of the Cosmos, along the way answering our questions and those we didn't even think to ask. For long-time fans of her Facebook Space Place and those unfamiliar with her work, it's a chance to revisit some of the most bizarre and interesting places in the Universe, as well as learning more about the amazing feats and discoveries of our favorite missions of exploration." Linda Morabito is the former NASA Jet Propulsion Laboratory engineer and astronomer who made the discovery of the active volcanism on Jupiter's moon Io on March 9, 1979. This discovery has been heralded by some scientists as the largest discovery of the planetary exploration program. Linda has received many top honors and awards for her work in science. She has recently completed her new Astronomy book, "A Journey, Science Essays on the Leading Edge of Discovery," and has previously authored her memoir, "Parallel Universes, A Memoir from the Edges of Space and Time." 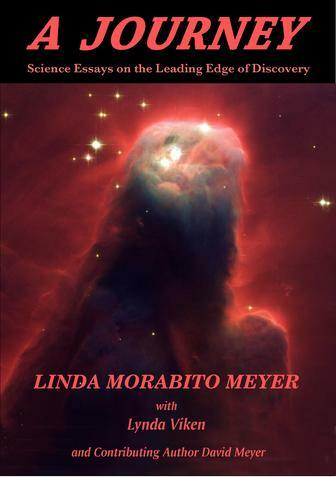 As college students will tell you, Linda is a renowned speaker about the scientific wonders of the universe and with the publication of her memoir will become perhaps one of the foremost inspirational speakers in the nation. Find out about the latest Astronomy News! Be sure to check out the growing "Linda Morabito's Space Place " on Facebook! Here is what people are saying about LMSP! Linda, I really don't remember when I found your "Space Place" but you have shared with me and the online community the knowledge of the Universe in a way I have never thought possible. The words you write down are so poetic! It get us to feel like we are actually walking next to Opportunity on Mars, Floating next to a Black Hole, watching Stars form in our distant Galaxy. I want to thank you so much for opening all our eyes and minds to the wonderful Universe. I heard Linda speak at the LWML event in Ridgecrest on Oct. 2nd and you could hear a pin drop in that sanctuary as she so eloquently and movingly told her story. She is truly inspirational. I would be interested in obtaining her book when it is available.